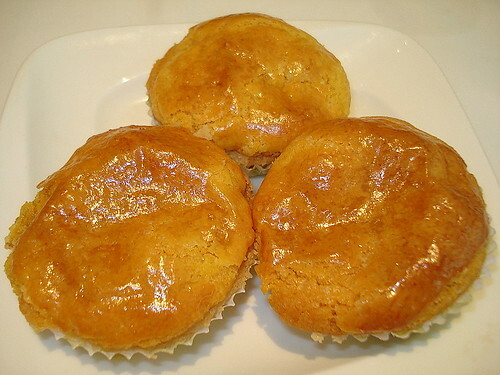 Mango and chicken tarts, originally uploaded by Camemberu. We went to Hua Ting actually a day before Lei Garden at CHIJMES about two weeks ago. I delayed this entry as it would have been too much Cantonese food at one go for the blog. Anyway, it was our first time at this award-winning restaurant and in general, we were quite happy with the quality of the food. These mango and chicken tarts above were lovely! More sweet than savoury but each bite brought an intense burst of flavour in rich crumbly pastry. A great starter. 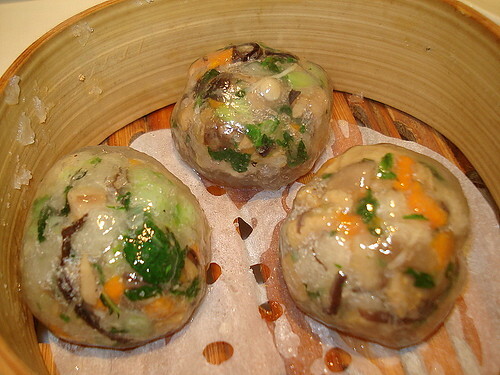 Shrimp dumpling with yam cubes, originally uploaded by Camemberu. Another tasty set of bites. 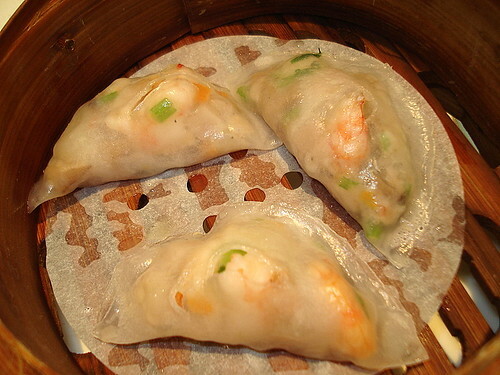 Thin, translucent skin encasing generous portions of shrimp with yam and chopped spring onions. Very delicately flavoured. I felt like having more. "Kow Kei" (Medlar seed plant) with three different eggs in stock, originally uploaded by Camemberu. This dish was not on their (rather limited) vegetables menu, but was suggested by the waiter. 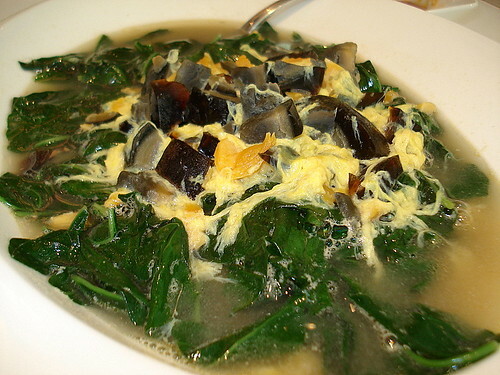 I love eggs, what more three different types (normal, salted and century egg) - so this is one of my favourites (not so for hubby). Competently executed but I may have had better at Crystal Jade. Wee bit pricey here at S$18. 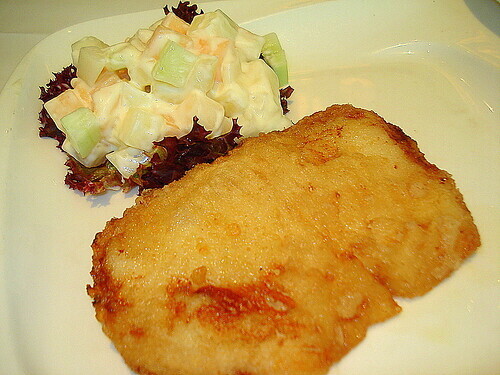 Pan-fried cod with fruit salad, originally uploaded by Camemberu. Some dishes are priced by the portion (per person). This dish of cod was a single person's portion (S$20) we ordered to share. A thin fillet, fairly fresh but slightly greasy. We didn't think the fruit salad went well with the fish. 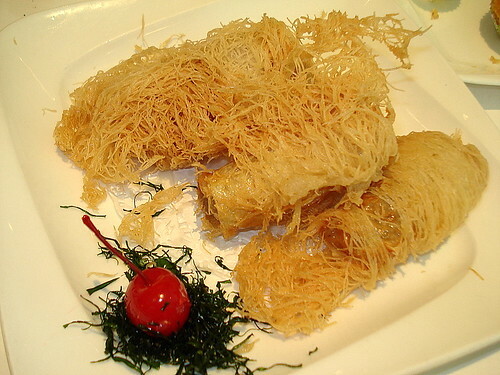 Scallop paste wrapped in crispy noodles, originally uploaded by Camemberu. Vegetable dumplings, originally uploaded by Camemberu. 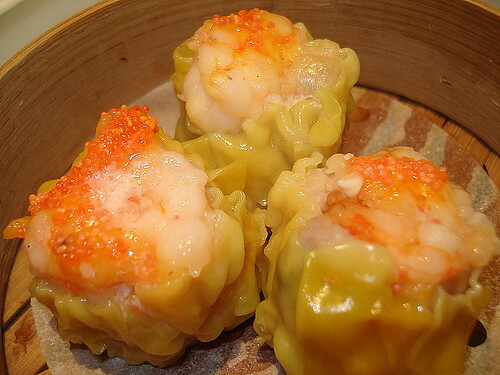 Siew mai, originally uploaded by Camemberu. These are the largest siew mai I have come across in any Cantonese restaurant. Robust as they are tasty! They deserved the S$4.80 price tag. 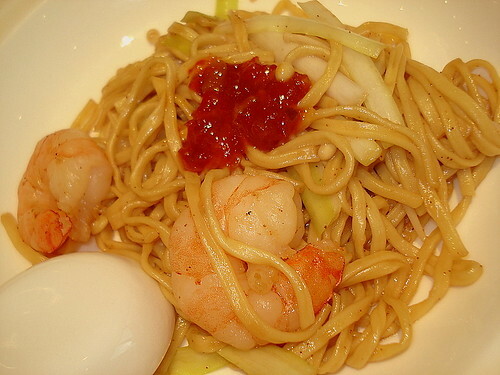 Ee-fu noodles with shrimp roe and shrimp, originally uploaded by Camemberu. Lots of big, crunchy shrimp but I didn't see any roe (was it supposed to look like ebiko? ), only very tiny dark speckles. I love ee-fu noodles but it's hard to find a really good one with hearty flavour and oomph. This was all right - needed the dollop of chili sauce to pep it up. I think we were also too full at this point in time to really enjoy more carbo. 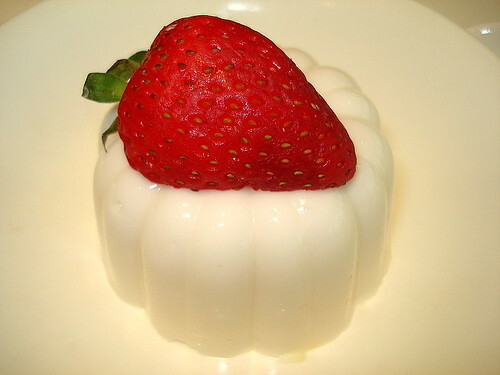 Coconut pudding, originally uploaded by Camemberu. Dessert was cute but the coconut tasted a little too processed. Firm white pudding topped by a bright red strawberry half. This meal for two actually cost more than the Lei Garden set lunch for four. Luckily my UOB card lopped 18% off the bill. Food is generally good here but it's a pricey place to experience the hits and misses. i wanna go hua ting! haha! how much is the dinner?